The Morobe Show is hosted by the Morobe Provincial Agricultural Society and showcases the various agricultural, industrial and commercial features of the Morobe Province. 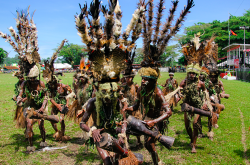 The event also showcases the incredible cultural variety of Morobe, home to Papua New Guinea’s second largest city of Lae. The city is home to a growing number of settlers from the neighboring regions of the Highlands, Momase and New Guinea Islands. Visitors to the show can expect to see stunning exhibitions of Papua New Guinea culture, agriculture, horticulture, livestock, commercial businesses, NGO’s, and school parades.